Looking for the best nonstick cookware for healthy cooking at home? You will find everything here you should know about. Healthy eating has become a major concern these days among home owners. So, everyone wants to cut down on fat in their food. Controlling the daily fat intake is the best way to lead a healthy lifestyle. But some types of cookware don’t stand by us by controlling the amount of fat used in cooking. To cook with less fat, nonstick cookware is your best bet. You need a good non-stick cookware set as a great alternative to traditional frying pans. In addition, they can cook with less fat and are oven safe and dishwasher safe. What to Know about Nonstick, PFOA and PTFE Coatings? Many people are worried that nonstick cookware emits toxins on the food when overheated. Due to this reason, it has got negative image over the decades. Also known as Teflon by DuPont, the Polytetrafluoroethylene or PTFE coating has been used since 1940s. Teflon is made with another chemical named PFOA or Perfluorooctanoic Acid. Over the years, whether PFOA is harmful has been the matter of concern. Though the chemical often fades in manufacturing process, it is not clear whether Teflon pans are harmful. But according to research, it is clear that nonstick cookware is safe if it is used according to manufacturer’s instructions. If you have to perform broiling, searing or any high-heat cooking process, choose a traditional cookware which doesn’t has non-stick coating. Type of oil used in these pans should also be considered. 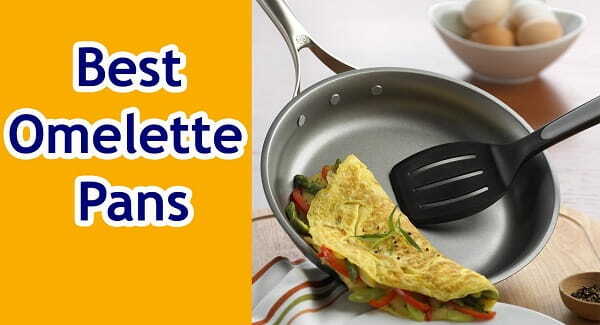 If you are reading this post, we bet you want the best nonstick cookware set in your kitchen. If you don’t know what to look for, don’t worry! Just keep in mind that some cookware sets have just one coating while some are double coated. It’s up to the purpose of using nonstick cookware. For example, some models come with titanium coating while some are covered with ceramic coating. Size – You should also consider the size of your nonstick cookware before ordering. Check the size of pan and pot and ensure that it is large enough to cook your favorite recipes. Along with its area, also consider the size of handles. Handles should stay cool while cooking and you can easily work on. 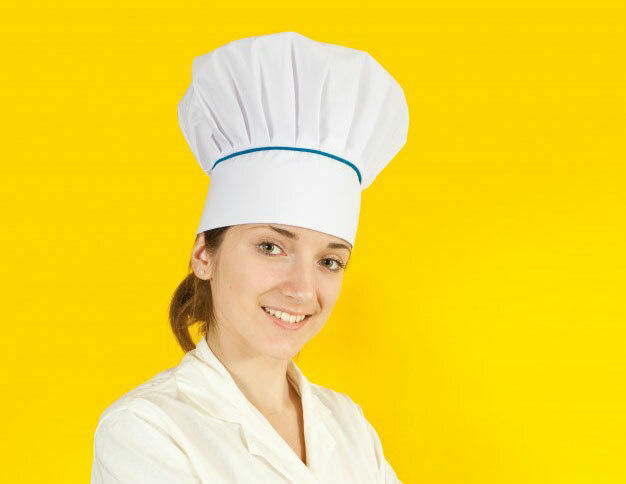 Cooking Preference – Before you look for a nonstick pan, look at your cooking style. If you are running low on budget, low-cost cookware usually is not compatible to some modern cooktops like induction and some are even not oven safe. If you use oven for cooking, you shouldn’t worry about expanding your budget to afford a right cookware set. Some models are compatible to gas stove only. So, it’s up to you to choose the right product depending upon your needs. Be sure to check specifications before buying. Warranty – Warranty is the next and most important thing to consider and stay assured about the quality. Be sure it has extended warranty for at least 2 to 3 years. Different cookware sets have different warranties. 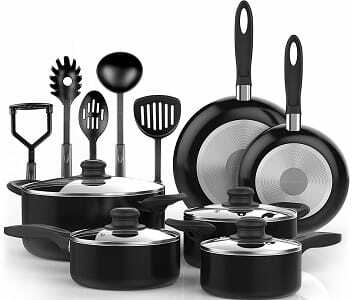 Some cookware sets have up to 2 years of warranty, while more expensive and branded ones have lifetime warranty. Different brands offer different cookware sets. But T-fal is a reputed name when it comes to non-stick cookware and accessories. And T-fal E765SC is no exception. Its red dot in the heart of pots and pans is its USP. It eventually turns red when it is kept on the cooktop, which indicates your pot and pan is ready to cook. The pots have glass lid for smooth cooking. This set is made of top quality steel to ensure good performance and durability. 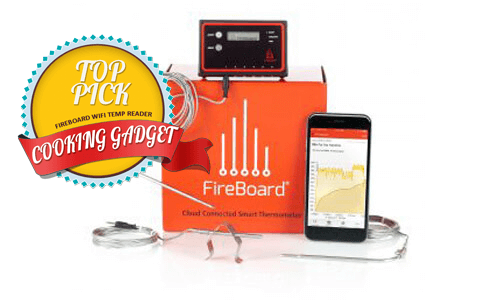 Thermos spot technology to check your pan’s preheating status. It can be seen in the form of red dot in the heart of pan or pot. It consists of 12 cookware items for varied cooking styles. 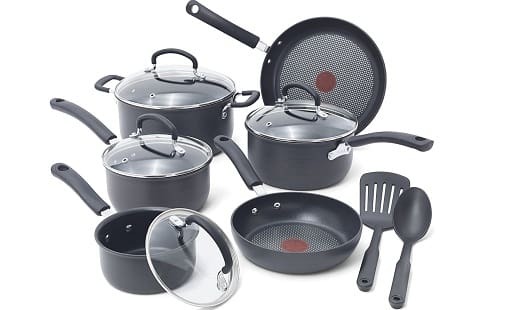 Cookware set includes 12 cooking items in total, including 6-quarter stockpot covered, two 8” and 10” skillets, one 3-quarter sauté pan (covered), and two 1-quarter/3-quarter sauce pans. Its appealing color is the USP of the cookware. But there is something more to it. 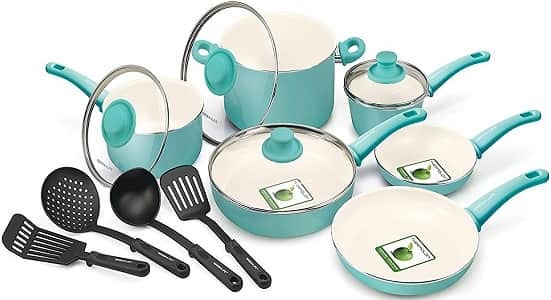 The beauty of this cookware set is its nonstick coating which is free of PFOA. So, food is easy to slide and flip even with using less oil. It is made of aluminum which is both durable and good conductor of heat. Get ready to enjoy stress-free cooking with it. 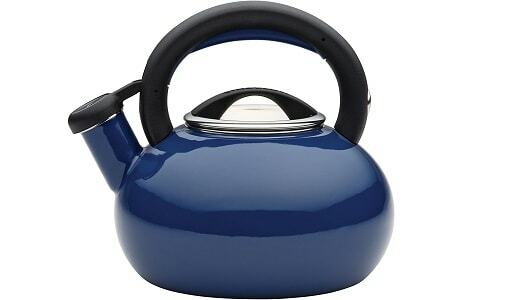 It has robust double-riveted stainless steel handles on the pans and pots for easy movement. Don’t worry about heat. Handles are covered by rubber which remains cool, no matter what. It resists up to 400 deg. F, so it is oven safe as well. Cook any type of food on this cookware set. One set for all your cooking needs. No need to buy any extra accessory. Made of hard aluminum for even cooking and value for money. PFOA-free non-stick coating on interior and rock solid enamel porcelain on exterior. Food flips and slides smoothly even without using much fat. Cook your favorite cake, omelet, or other dishes with low fat. Resists up to 400 deg. F. and is oven safe. It is both stylish and high performance cookware set which is recommended by several leading French chefs. 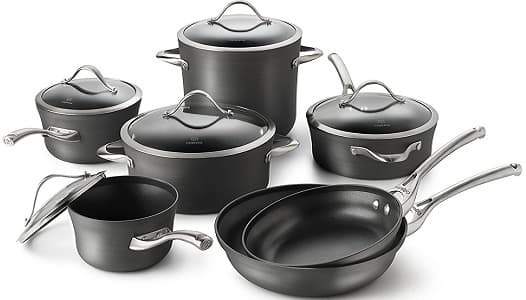 Cuisinart maintains the legacy for 30 years in making the best kitchenware and Cuisinart 66-17N Chef’s Classic Non-stick cookware set is one of them. It is made of hard anodized aluminum for top cooking performance in daily meals and special occasions. Exterior is even dense and harder than stainless steel for both professional and home use. It’s nonporous, harder, dense, and durable. If you are health conscious, it is the best choice for you. It is dishwasher safe. Handles are stable and cool enough for safe cooking. 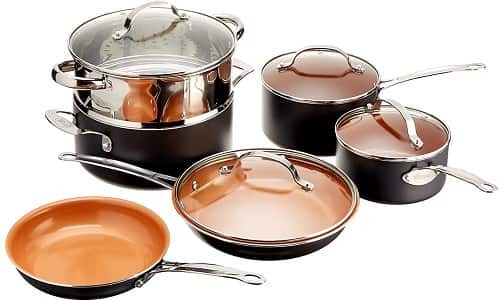 Stainless steel lids literally fit well and it is oven safe up to 500 degrees F.
One cannot go wrong with this set as it is the best choice of French chefs. Though it is dishwasher safe, it is better to wash it with hands. Don’t overheat it for longer or it may affect its nonstick coating. The entire set looks simply beautiful. It is also available in varied color options like blueberry, aqua speckle, coral, butter, oatmeal, lavender, pear, red etc. with speckles on outer porcelain. It includes 1qt and 2qt saucepan covered, 2.75-quart sauté pan (covered), 6-quart stockpot (covered), 8” and 10” skillets as well as 5-piece spoon set. Its color resists stains and heavy-gauge base don’t have hot spots which are likely to scorch or burn foods. It has DuPont Teflon nonstick interior coating. Tempered glass lids have cool handles. The twice riveted handles are soft with O-rings for hanging. These are oven-safe pans that can resist up to 350-degree F. They are not dishwasher safe and not induction compatible. You can use them on induction, gas, and glass cooktop. If your budget doesn’t allow, it is better to go with Vermi nonstick cookware set. It has 15 accessories for all your cooking needs. 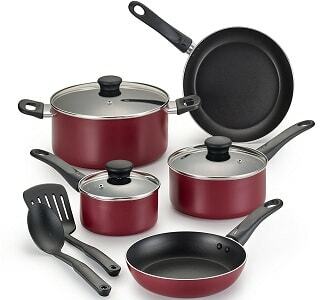 The cookware set includes 5 non-stick utensils, 2 fry pans, 2 Dutch Ovens and two saucepans packed with glass lids. The set includes top quality pots for longevity without any major damage. Unlike other sets, this set includes all accessories made of tough materials. So, there is no complaint in durability at all. Each item is made with non-stick coating. You don’t have to use much fat to cook food. Each cookware is large enough to cook hearty food for full family home. If you have bought a new home or starting a married life, it is your best bet. Cook varieties of recipes with ease. Food slides without any burn mark and needs low fat. Food never sticks on it thanks to non-stick coating. Covers various models and sizes of cookware. It is dishwasher safe and easy to clean. It is better if you wash it with hands. 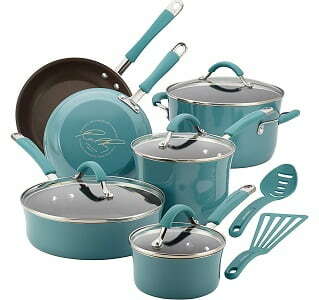 Calphalon is a household name in offering best quality kitchen utensils and this nonstick cookware set is no exception. It has covered virtually every nonstick cookware you need for daily cooking. All the cookware set is made of hard anodized aluminum. But scratches are the major concern for most users in nonstick surface. In case of Simply Calphalon cookware set, you can stay rest assured in this matter too. Food slides well and gets heat evenly. Double-coated interior with reliable, sturdy nonstick coating. It means food slides easily without sticking on it. It is also easy to clean like other items. It is also oven safe as it resists heat up to 400 deg. F.
It is easy to use no matter you are a pro or a beginner. 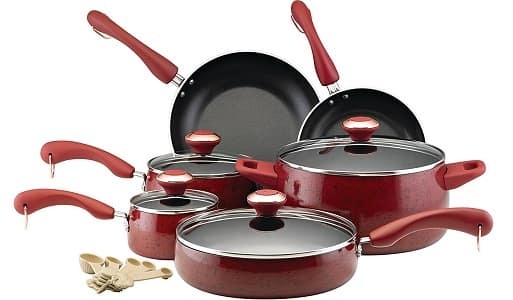 If best and affordable pans and pots is your need, we recommend you to buy this cookware set. It has different types of non-stick kitchen accessories to cook various types of food. It is made of hard aluminum and is very durable. It has got positive reviews from most users. It is also available in different color options. It takes very low fat and oil to cook food as it has nonstick ceramic coating. It is perfect for daily use. The base is heat conductive and can be used on cooktop for long time without any stress. Able to cook food on various cook tops. Gotham Steel non-stick cookware set’s interior is made of ceramic and titanium coating. You just need a tad of oil or butter and see every food slides off evenly. All the pans and pots are PTFE, PFOA, and PFOS free and are lightweight. The set covers 8.5” frying pan with lid, 10.25” frying pan with lid, 1.5-quarter pot with lid, 5-quarter aluminum steamer pot with lid, 2.5-quarter pot with lid, etc. it weighs only 12 pounds. It is suitable for all stove tops, including glass, gas, electric etc. Coating won’t peel off. You can easily cook acidic food in it. Interior won’t scratch while cooking and washing. 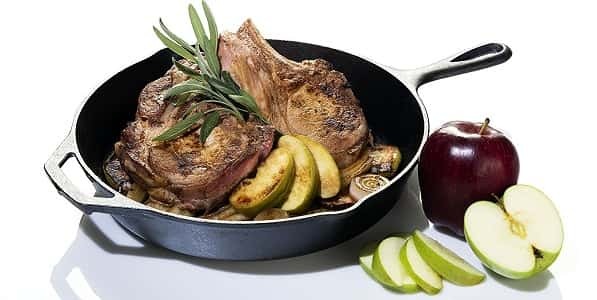 It can resist up to 500-deg F.
Calphalon Contemporary Nonstick Cookware is very durable and long-lasting as it is made with multi-layered nonstick coating. It has two layers of non-stick coating for ultra durability and one layer for easy release. It is made of heavy-duty aluminum for even heating. The long handles are made of brushed stainless steel to stay cool while cooking. Both covers and pans are oven safe. Simply Calphalon’s products are made by adhering to strict durability and performance industry standards. These are made of a disc of medium-gauge, virtually pure, hard-anodized form of aluminum for even heat distribution. 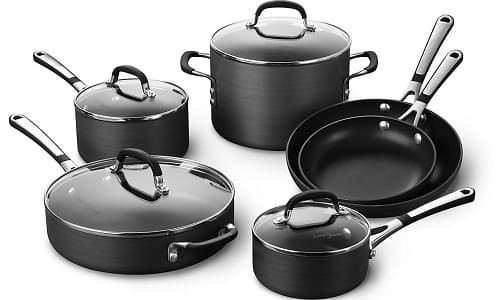 The hard-anodized cookware range from Calphalon are very durable and up to 80% harder as compared to stainless steel. This 10-piece non-stick cookware set provides almost everything you need for tasty and healthy meals every day. It is made of sturdy aluminum which is built to last. It has quality non-stick coating inside for quick cleanup and smooth cooking. The handles are designed well to provide comfortable and safe grip. It delivers even heating to cook food and can be used in oven with up to 350F resistance. It comes with limited 10 years of guarantee. 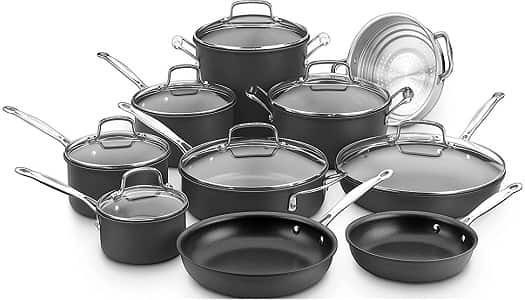 If you have just now bought a nonstick cookware and don’t know how to use it or even clean it up then this article will answer all your queries regarding using, seasoning, cleaning and storing a nonstick cookware. Have an understanding of which meals would be cooked best in a nonstick cookware. Generally items such as eggs, fish fillets and pancakes, etc. are best made on these cookware or items which are generally cooked on medium to low heat. Use silicon or plastic or wooden tools ready to cook in these cookware as metal tools would scratch the inside coating and will ruin the capabilities of non-stick cookware. Stick to the medium or low heat when cooking with these as they are not good at retaining heat since they are not heavy bottom cookware. Always use your exhaust fan or chimney while cooking in these nonstick cookware. Use a little oil or butter to cook. Always let your cookware cool down before washing it. Since the coating on the nonstick cookware tend to wear off, it is better to get the same season. Wash your nonstick cookware and dry thoroughly and ensuring there is moisture remaining. Pour some vegetable oil on a paper towel and then spread like a coating in the inside of the cookware. After cooling it down, wipe off the excess oil with the help of paper towel. If case of any doubt you can always check with your user’s manual. How to clean your nonstick cookware? 1. Use the softest part of your dish sponge first while cleaning the utensil. 3. Soak them in hot water and baking soda in case the stubborn food bits are still present. • In case you are frequently using nonstick cookware, it would be best if you would be able to let them hang and there should be space between them so that they don’t scratch against each other. • Place a dishrag or a paper towel between them to avoid their aluminum bottoms come in touch with the one places beneath it. • Also ensure that there is enough space so that they can be taken out without scraping the bottom of one utensil on another. You must be very careful while storing these utensils. Also make sure that you season them at least twice a year. It greatly helps in protecting the nonstick coating of the utensil and also fills in any kind of inconsistencies or pits that developed on the surface of your nonstick utensil. We hope this article has helped you make the right decision to buy a new set of nonstick cookware. No matter you are a newlywed couple wants a fresh start to your life, a professional chef, a retired employee, or a housewife, the nonstick cookware sets listed above can make your cooking life a breeze. You may definitely want to try your new recipes with these cookware sets, invite your favorite people to your dinner party, or just enjoy cooking in daily life with your new set of cookware.